"Some friends can be REAL MONSTERS. And some monsters can be REAL FRIENDS." 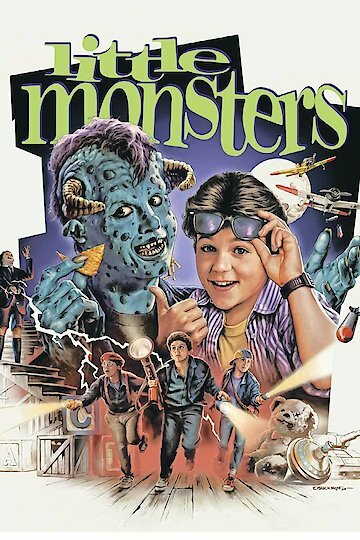 Little Monsters is a comedy fantasy film that stars real-life brothers Fred and Ben Savage. The Savages play brothers Brian and Eric Stevenson. Their hot tempered father is played by Daniel Stern, Fred’s alter ego from the television show The Wonder Years. The movie tells the tale of what really goes on under the beds of children. Brian is upset about moving to a new town because he doesn’t have any friends. Things are made worse when Brian is blamed for making messes and breaking furniture in the household. Brian believes that his brother, Eric, is responsible. The two bicker, and Eric tries to claim that there was an intruder under his bed. Brian agrees to stay in Eric’s room to prove him wrong. That night, Brian sets a trap that captures the intruder. They pull the trap away to reveal a real-life monster that has been causing all of the mischief. The monster introduces himself as Maurice, and he comes from a magical world accessible to reality only under children’s beds. Maurice is portrayed by comedian Howie Mandel. Brian and Maurice come to find that they have a lot in common. Maurice invites Brian to join him in playing pranks on innocent kids. The monster world is a dream world for Brian at first. In that land he is able to play video games as much as he wants and eat as much junk food as he can. The two enjoy several nights of shenanigans. Brian begins to sour on the stunts when Maurice and some fellow monsters stop at a home and try to scare an infant. Brian also starts to show symptoms of spending time in the monster city. He starts to turn into a monster himself, so he saws the legs off of his bed to prevent monsters from entering his home. Trouble starts when Eric is kidnapped by an evil monster. Brian has to team up with Maurice to find and rescue Eric and get back home. Little Monsters is currently available to watch and stream, download, buy on demand at Amazon Prime, Hulu, Sling, Amazon, Vudu, Google Play, iTunes, YouTube VOD online.